My massage therapist mentioned a couple weeks ago that she had a craving for those light-as-a-feather round crumbly cookies made with tiny bits of walnuts and dusted with sugar. She asked if I knew where she could buy some, but I’ve not seen them in the few decent bakeries around here – or anywhere else, for that matter. In fact, the only time I’ve seen them is at holiday gatherings, where they’re often right next to the pizzelle cookies. 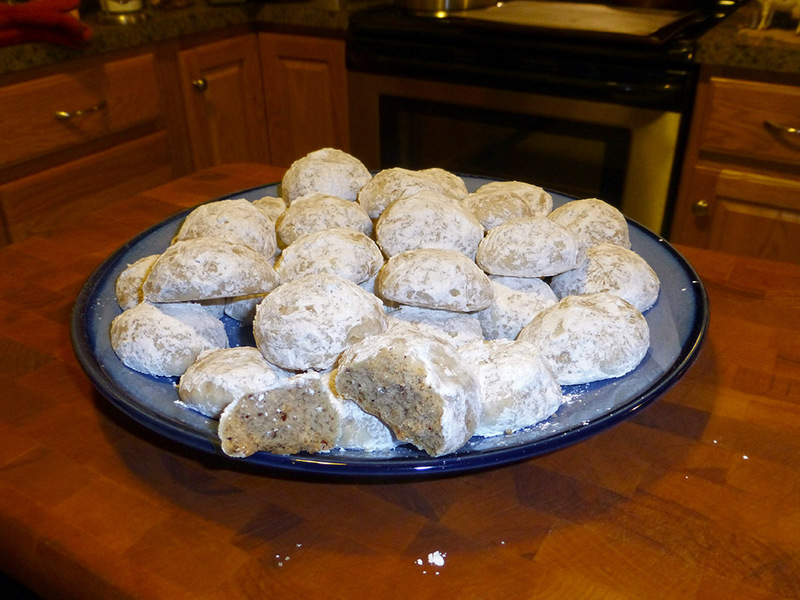 Neither she nor I knew their name, so I googled ‘Italian walnut cookies’ tonight and found all the other variants. They are variously called…deep breath…Mexican wedding cookies, Mexican teacakes, Mexican wedding cakes, just plain wedding cookies, kourabiedes, Russian teacakes, kiflik, Armenian sugar cookies, Easter cookies, butterballs, bullets, mantecosos, pecan butterballs, nutballs, cocoons, vanillekipferl, mouldy mice, pecan dainties, bizcochitos, snowballs, pecan snowballs, vanilla snowballs, walnut snowballs, and snowdrops. In other words, most cultures have a version of this cookie. However, the one thing I didn’t find was an Italian name for them. It is perhaps obvious to you that when a friend asks me about a hard-to-find baked product, the eventual outcome is foregone and inevitable, but I wouldn’t accuse mates of taking advantage of that fact. They can’t help it just as I can’t. I can report that my mouldy mice are of a much lighter texture and more delicious than any I’ve ever had at a Christmas party. “Not too shabby” said I on tasting the first one. No, wait…”Holy crap!” was actually my first utterance, followed immediately by my shabbiness estimate. They melt in the mouth and are great with coffee. I’m sure she’ll be delighted with the box I’m bringing over tomorrow. My version is an adaptation of King Arthur Flour’s recipe. I replaced their almond extract and almond flour with a scant half-teaspoon of freshly ground nutmeg and a cup of toasted pecans, cooled completely then chopped very finely in my mini food processor. I also bumped the vanilla extract up to two teaspoons. I inadvertently over-processed the pecans just a tiny bit, so they ended up slightly wet – but well short of pecan butter – and, as I suspected, baking therefore took about four minutes more than the maximum they state. Distilled, the warm smell of pecans, nutmeg, and vanilla in my house right now would make a fine cologne, I think. This entry was posted in Baking and tagged mouldy mice, snowballs, wedding cookies. Yeah love these ! And good catch with exchanging the walnuts for pecans. You hear about more and more folks being allergic w aphfts and horrible mouth sores these days ! So pecans are a nice substitute. In Europe we have those almond moon shaped slivers that are very similar. I’d say these are just about everyone’s favorite ! Oh and I’ve never seen these in Italy. Only Austria, Germany etc. Russian Tea Cakes – one of my favorites.. I can confirm that they are occasionally found at the Ceres St. Bakery on Penhallow St. in Portsmouth, and are almost always available at Sweet Dreams Bakery on Rte. 108 in Stratham, N.H. About the ONLY confection that I can’t stop eating in abundance, if they are left out, I lose all control! The more buttery, the better. Mmmmmm!